American actress Shannon Elizabeth is known for her memorable appearances in blockbusters such as the American Pie series and Scary Movie. But now the celebrity is taking on a new lead role: as the head of her own animal and environmental activism organisation. Elizabeth has long been a champion for animal rights. Her first big foray into activism was in 2001 with Animal Avengers, a charity that began as a dog and cat rescue in Los Angeles. Now, she’s launching the Shannon Elizabeth Foundation (SEF) to help educate children and adults about endangered wildlife. As part of the launch, Elizabeth has been working with one of South Africa’s leading social enterprises, the Relate Trust, to develop a special bracelet that will help raise funds for the SEF with a focus on developing the Rhino Review, the first Review under the umbrella Wildlife Review Initiative (WRI),as well as their various other programs, including Animal Avengers, the Foundation’s youth education program. Elizabeth wants the WRI to become the prime globally recognised and trusted hub of information when it comes to matters surrounding conservation. The Rhino Review programme would therefore be a source of information about all matters concerning this endangered species and also aims to better direct philanthropic investment into conservation and to the people that are making the most impact on the ground. The SEF Relate bracelets are made of hemp cord and coconut beads, which makes them 100% environmentally friendly. 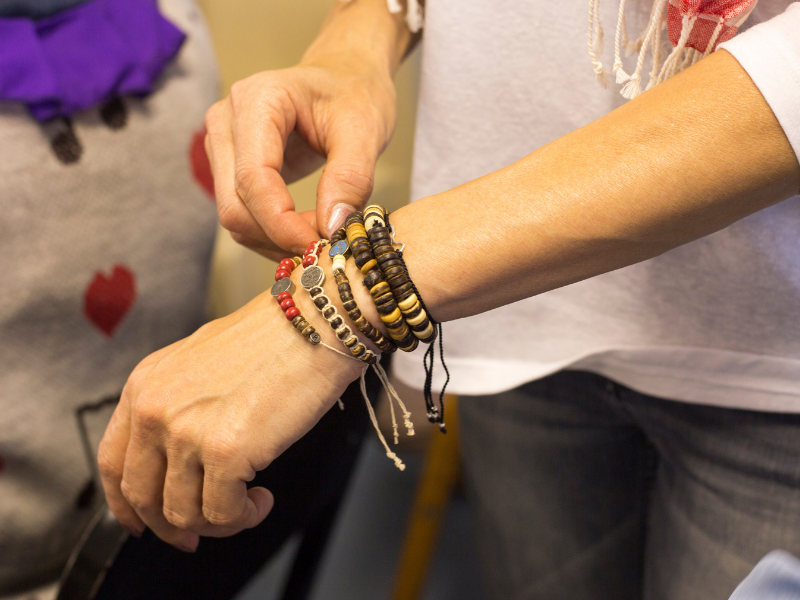 Relate employs elderly people and youths from underprivileged backgrounds to make bracelets like these for a range of charities around the world. Speaking about her decision to work with Relate, Elizabeth said: “The SEF and Relate share values, including uplifting women and young people. Relate CEO Neil Robinson applauded Elizabeth and said it was because of passionate individuals such as her that Relate, which has raised more than R50 million for various causes, has been able to make the impact that it has. “We need to educate future generations about the importance of preserving our natural heritage. It’s inspiring that someone like Shannon gives so much of her time and energy for such an important cause,” said Robinson. The actress visited one of the Ikamva Labantu senior clubs for a behind-the-scenes look at how Relate’s bracelets are made and where she met with the gogos and tatas who thread the organisation’s bracelets. "Relate has been wonderful to work with. I’m thrilled that they’ve been able to create a bracelet that embodies what the SEF is all about. It is environmentally friendly and sustainable, which is in line with our organisation’s principles and beliefs, while also raising funds for and creating awareness about the cause,” said Elizabeth. Shannon Elizabeth Foundation bracelets are available online here.